and the Central Bus Station (BSÍ) in Reykjavik. The bus service brings you directly to your hotel, be sure to buy a ticket all the way. You walk across the parking in front of the arrival hall to get to the busses. Tickets can be bought on arrival inside the terminal building at the Reykjavik Excursions booth or in the ticket machine located by the exit door of the terminal building. Sometimes you can even buy the ticket on board Icelandair planes. 2. Money can be exchanged at the local bank at Keflavik airport, and ATM machines are located widely around town, close to the hotels and credit cards are accepted (almost) everywhere in Iceland. The exchange rate should be better than in your home country. 3. Monday 4th March – early registration and welcome drinks at SKÁLI– University of Iceland, School of Education, v/ Stakkahlíð Háteigsveg between 18.00 – 19.00. 5. Tuesday 5th March – Culture and history walk Reykjavík downtown 18.00-19.00. Meet at the harbor and take a short walk through old downtown Reykjavík with a guide – interesting stories and sights -. The tour ends at the Iðnó Restaurant for the conference dinner. 6. 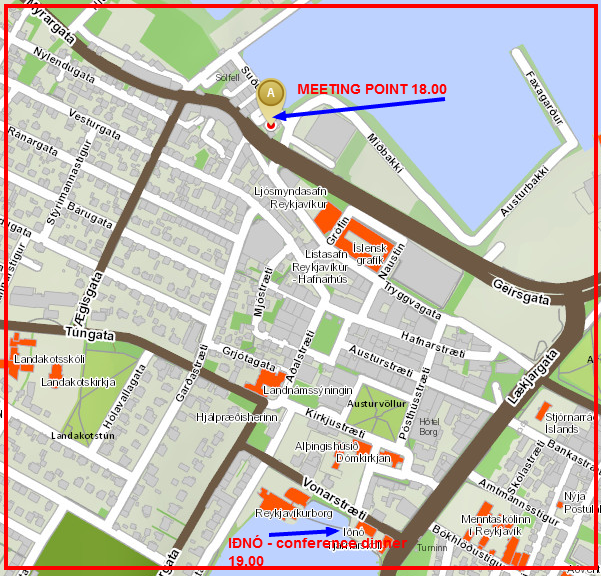 Tuesday 5th March – Conference dinner Restaurant Iðnó 19.00. For those who have not registered yet please let us know if you will be attending the dinner. 7. Please note that if you have food allergies or food intolerance you must also notify the waiter on site – we have also sent the requests beforehand.